Congratulations, Mr. Ledger, on becoming a member of the Academy of Motion Pictures Arts and Sciences. It's amazing what a haircut can do! 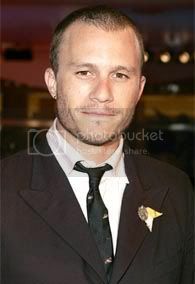 Heath Ledger has been our secret crush even since we saw 10 Things I Hate About You, but now he's all grown up. 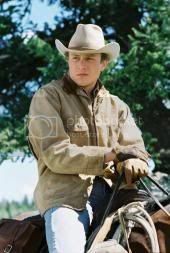 As a partner to Michelle Williams (Can't you just pop the question already, Heath?) and a new daddy to their baby girl, we're just glad he still finds time to act. But does he still take time to groom? He found his inner surfer in the summer flick, Lords of Dogtown, but his outer appearance was dreadful. 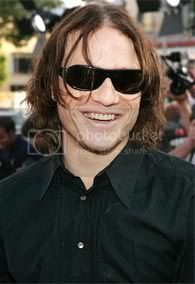 Beach bums are known for their long hair and shades, but Heath could have at least continued to shampoo and condition. (Gosh!) Luckily, his new roles in Casanova and Brokeback Mountain inspired him to shave his gnarly locks to a short buzz cut with some matching face fuzz. (Could this Aussie's dimples look any cuter?) The suit's a little serious for our taste, but we're glad to see his style mature with his roles. So, which Heath do you prefer: the Surfer Boy or the Suited Man? If those are my only two choices, I'll chose the short haired Heath. But I really prefer him to have some hair, kinda like 23 yr old Ennis. "I've got my eye on you Jack F'in Twist"
I had a dream about Heath last night...well it was sorta Heath/This guy from work who reminds me of Heath, but it was still a great dream..one of those that feels so real. Don't you just hate waking up from those? 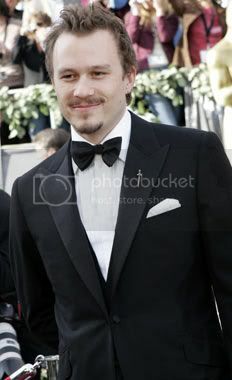 Just can't seem to post Heath without even a smidgen of Jake.